This law explains why rivers, trees, snowflakes and even our vascular system exhibit the same branching design. It is also why hierarchies persist in human systems. For top-down flow, a hierarchy, is the optimal design for flow. 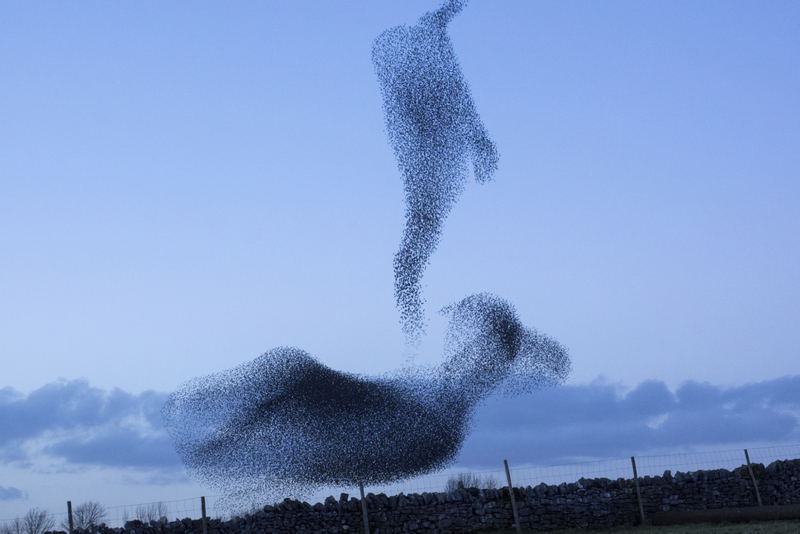 Other than in nature though, human systems tend not to have the freedom to create fluid, evolving hierarchies. So why is this important or interesting? Flow is a key notion when seeking to enable strategic agility. In the world of Lean manufacturing, optimising flow has always been central and it is becoming increasingly central in the Agile world as well. 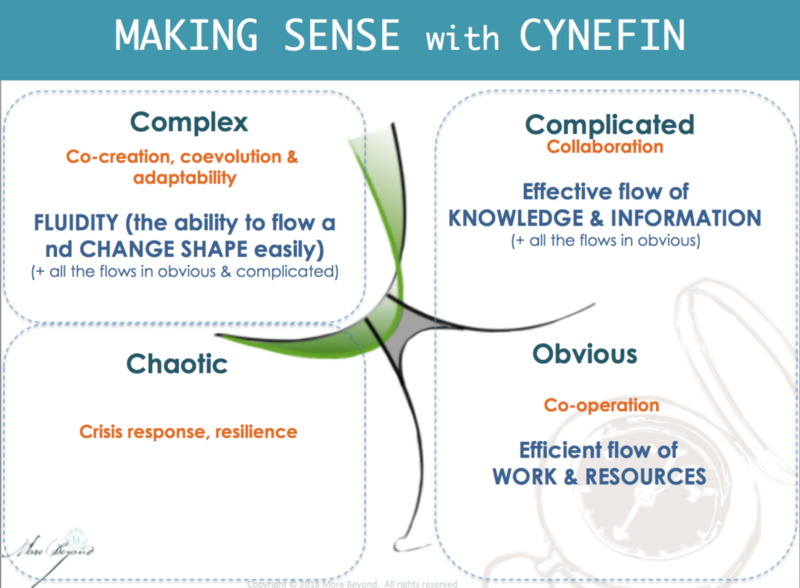 I found it useful to make sense of this idea of flow using the Cynefin framework (please note, this is my own working hypothesis – a half-baked potato if you will, so it is not presented as gospel …). I am fully aware these aren’t all the flows (i.e. it’s not complete) and the primary flows in obvious also exist in complicated and all of them exist in complex as well. I.e. work, resources, information, knowledge and many others also flow in complex to which is added the idea of fluidity. So read this as the primary flows we focus on in each domain, but not as exclusive categories. Considering only the 4 primary domains, it makes sense for me to think about is as follows: In Obvious contexts, completely predictable, repetiive routine e.g. manufacturing contexts, the primary flows are flow of work and resources. 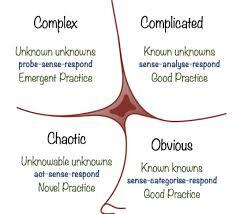 In complicated contexts, where we’re dealing with known unknowns, but where cause and effect relationships are not obvious and analysis and expertise are required, in addition to work and resource flows, we need to focus on the effective flow of information and knowledge. These two ordered system domains exhibit linear cause and effect relationships and stable contexts, hence the focus is on efficiency and optimisation. In the chaotic domain, it was a challenge for me to think of what needs to flow here. A conversation at the conference led to the idea that maybe the flow that matters here is that of energy i.e. to contain the energy (emotional and otherwise) released in the chaos and ensure it flows in productive ways, not in desctructive fight/flight/freeze responses. It is in the complex domain where it prof Bejan’s work becomes particularly interesting. My hypothesis is that in complexity, in addition to flow of work, resource and information, systems need FLUIDITY, i.e. the ability to adapt our flow processes while in the flow. In the complex domain, the context is not stable: this is the so-called VUCA world. It is therefore critical for the system to be able to morph it’s structure. So then the question is how to enable fluidity. This seems to be a key aspect of both Prof Bejan and Prof Cilliers thinking. 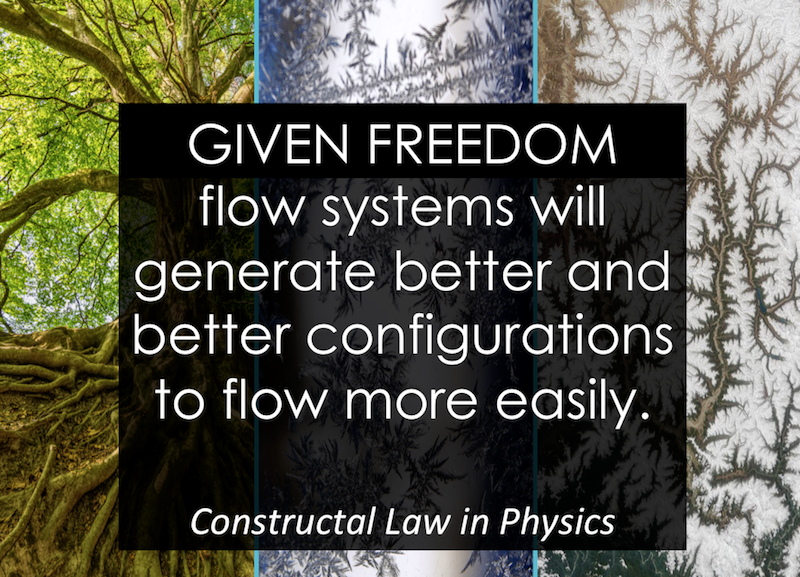 Hierarchies must be fluid; flow systems need freedom to morph their design. Simply focusing on introducing Lead or Agile methods at a team (or even organisational) level will not produce this fluidity. If one deconstructs the idea of agility, it seems to require three things (at least) … mindsets; practices and skills; enabling structures. In most so-called Agile transformations the focus is mostly on process i.e training people in skills and practices. We neglect the mindset shifts and enabling structures that are needed to facilitate a cultural shift towards agility. Most people who’ve been through Agile training still lack a basic understanding of what agility actually is; why it’s important; and what principles the recipes they were taught is based on. They most certainly are not more comfortable with uncertainty and ambiguity and while incentive and reporting structures remain unchanged, they are not incentivised to truly collaborate and act in the best interest of the collective. Fluidity requires multi-directional flow, not the predominantly one-way flow that hierarchies are optimised for. This raises the question if the current shift towards networks and structures as described in among others Stanley McChrystal’s Team of Teams is evidence of social flow systems morphing their design to optimise for the new kinds of flows they need to survive? In nature, form follows design. In human systems we tend to design first and then try to force flow through our designs. I believe that we need to focus on creating fluidity, not only flow and this will require adaptive, emergent organisation designs that are fit for each unique context. ensure organisational structures and processes are congruent with achieving fluidity i.e. don’t create cognitive dissonance by stating one priority but enforcing the opposite through performance targets and other processes and sytems. The idea of flow captures a lot of useful features of the relationships between internal and external features of a system. Ideas on what needs to be done to promote adaptive ways of working seem to have stabilised in the discussion and literature as far as it relates to relaxing control and enabling emergence. The gap in my mind is how we foster coherence and maintain a sense of purpose, to counter the characterisation of agile working satirised in the Dilbert cartoons as “… no more planning and no more documentation, just start writing code and complaining”. That seems to me to be the tension about which little is written – how to enable an adaptive organisation while ensuring some level of alignment and purposeful evolution as opposed to reactive adaptation.